Bill aims to amend the 1955 Citizenship Act to provide citizenship to persecuted religious minorities including Hindus and barring Muslims in Afghanistan, Bangladesh and Pakistan. KMSS leader Akhil Gogoi. File image. 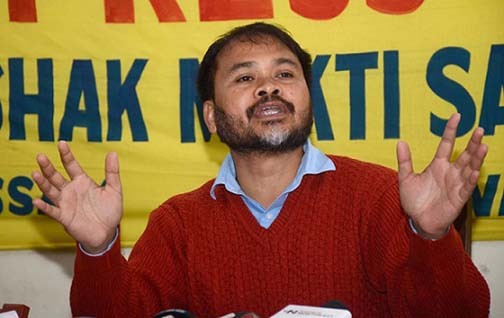 Krishak Mukti Sangram Samity (KMSS) leader Akhil Gogoi on Thursday exhorted the people to come out en masse on the streets to protest against the Citizenship (Amendment) Bill (CAB) 2016 from February 6 as there was a possibility of it being placed in the Rajya Sabha on February 7 or 8. Addressing a press meet here Gogoi said that in the eventuality that the Bill became an Act, then Assam would be swamped by illegal migrants and then Clause 6 of the Assam Accord which professed the protection of the indigenous people of the state would be of no use. The Citizenship (Amendment) Bill 2016 was passed in the Lok Sabha on January 8, following which Assam witnessed large scale protests by AASU and 70 other organisations. The Bill aims to amend the 1955 Citizenship Act to provide citizenship to persecuted religious minorities including Hindus and barring Muslims in Afghanistan, Bangladesh and Pakistan. Gogoi said that if the Bill became an Act 1.90 crore illegal migrants would become bona-fide citizens and the indigenous people would become minorities. They would lose their identity, become politically and economically powerless. Denouncing the divisive and confrontational politics of the BJP RSS combine, he said that this division was perceived in four area – – Hindu-Muslim, Assamese – Bengalis, Indigenous – non indigenous and also the numerous tea tribes. Calling state BJP president Ranjit Dass‘s claim that the BJP had 29 lakh supporters in the State , he said that this was a lie and that Dass should prove this in a meeting at Guwahati or even Tinsukia where even 10 per cent of this figure he had cited would not turn up. Not even 29 would be seen, he said. “All the knowledgeable and good people have left the party long back” he said. Akhil Gogoi said that the BJP was playing dirty politics by placating Bengalis so that they got votes in Tripura, Assam and West Bengal. Regarding the confrontational tactics being adopted by the party Gogoi said that the incidents at Nalbari and Tinsukia were both to be condemned but warned that if the police arrested the culprits involved in the Tinsukia incident where an RSS cadre had been beaten up, then it should first arrest those who had manhandled AASU members at Nalbari, as this had occurred before the Tinsukia incident. Meanwhile, slogan shouting and torch carrying AASU members took out a huge rally through the main thoroughfares of the town.